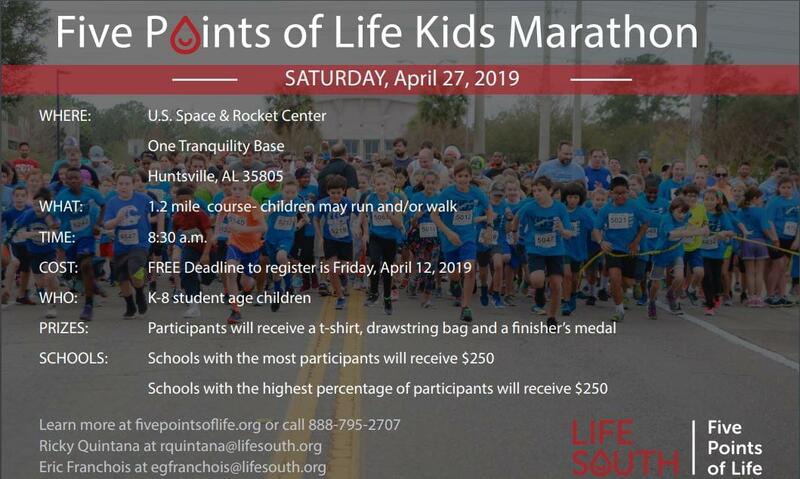 The Five Points of Life Foundation and LifeSouth Community Blood Centers are excited to invite you to be a part of the 2019 Five Points of Life Kids Marathon Huntsville. This year’s race will be held at the U.S. Space & Rocket Center, One Tranquility Base, Huntsville, AL 35805. 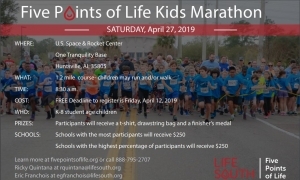 The Kids Marathon originated in Gainesville, Florida in 2007 as a part of the Five Points of Life Race Weekend which is held each February. The Kids Marathon series has now expanded to ten cities with over 4,000 participants annually. The goal of the Kids Marathon is to promote good health and physical fitness by giving kids the opportunity to run or walk an entire 26.2 miles, just like marathoners. To participate kids, kindergarten through eighth grade, complete 25 miles, one at a time, during the months prior to the marathon, logging each mile on the log sheet. To finish the full marathon kids will run the last 1.2 miles on race day. All participants will receive a Kids Marathon Huntsville race packet, race number (must be worn on race day), t-shirt and finishers medal. Kids must register in order to participate. CLICK HERE for more info, and join Steve and the ZYP team at this year’s Marathon on the 27th!